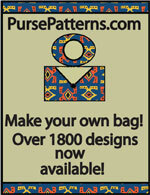 The Brancaster Messenger Bag Pattern by Charlie's Aunt is a unique messenger bag based on a 1940's fisherman's bag with a stylish asymmetrical front flap. 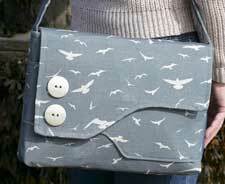 The Brancaster Messenger Bag Pattern by Charlie's Aunt is a 1940's inspired design with a stylish asymmetrical flap and front pocket. The shape is practical and you can either dress this handbag up or down depending on the fabric and contrasting pocket or strap. The template included for the front pocket also doubles as an interior pocket with a divider. Finished size is approximately as follows: Height 9.5” (24cm) Width 13” (33cm) Base width 2” (5cm). 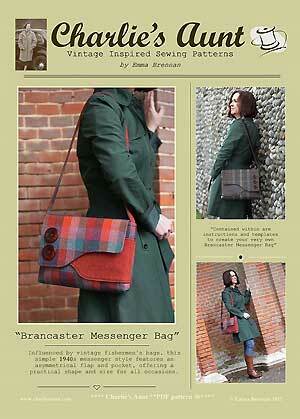 The Brandcaster Messenger Bag is in PDF format (downloadable) and has a total of 16 pages. 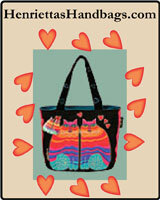 There is a one page cover photo, 6 pages of instructions and illustrations, one page of terminology, one page of additional photo ideas for the bag and 7 pages of pattern pieces.